Owen Mundy’s “I Know Where Your Cat Lives” has been selected for the 27th edition of the International Documentary Film Festival Amsterdam in November 2014. 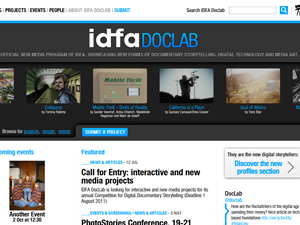 The project has been selected for the IDFA DocLab Competition for Digital Storytelling, will be presented at the DocLab exhibition, and is eligible for the IDFA DocLab Award. IDFA’s aim is to showcase the most beautiful and though-provoking projects that explore how digital technology influences human interaction. This year, a program is being presented called DocLab: Immersive Reality. With this program they explore exiting new digital technologies such as virtual reality and 360 video, but also reflect critically on how our everyday reality is increasingly mediated and tracked by digital technology.